What do you do when you see tomatoes on sale for $1.99 a kilogram? 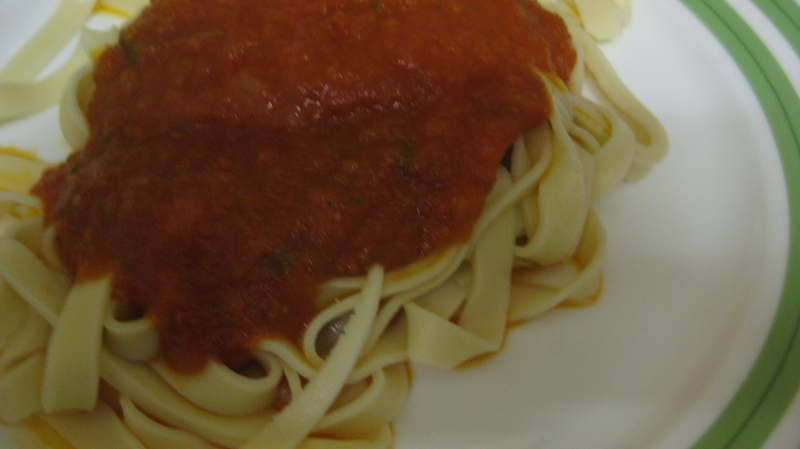 Why make pasta sauce of course! Another first for me, and with out a recipe, The following may not be the most time effective way to achieve a great tasting sauce, but it is definitely a winner if time is on your hands! Another bonus of this sauce is that it contains no stock powders, thus no gluten. If you are not concerned about gluten and are looking to save time, you can easily replace the recipe’s stock (really just infused water) with stock powder. Carefully make a shallow ‘x’ at both ends of the tomatoes. Taste and season accordingly. *This sauce will need a couple spoonfuls of sugar and a good hit of salt and pepper. I also found a generous amount of fresh basil really gave this dish a fresh, sweet flavour. Remove bay leaf and any other fibrous additions- blend till as smooth or chunky as you like it. Serve over you favourite pasta! This entry was posted in Gluten-free, Vegan, Vegetarian and tagged basil, cooking, dinner, food, gluten-free, healthy, homemade, how to, italian, lunch, pasta, pasta sauce, recipe, red sauce, sauce, thyme, tomato, vegetarian. Bookmark the permalink.